Ventrac tractor 4500 mowers fitted with dual wheel extensions can handle slopes up to 30 degrees. Ventracs feature a low center of gravity and an oscillating frame that helps keep all four wheels in contact with the ground while an innovative weight transfer system improves traction and stability needed on hillsides. In addition, Ventrac’s quick hydrostatic braking allows operators to confidently slow down, stop and reverse on hills. Want a demo? Call us at 612-333-3487 or fill out the form on this page. Looking for financing? Click here. Ventrac’s brush mower is designed for mowing high grass, thick weeds, and heavy brush. A large baffled front opening helps direct materials into the deck and helps hinder debris from escaping. Three heavy-duty blades counter rotate to cut and deposit waste evenly without windrowing. 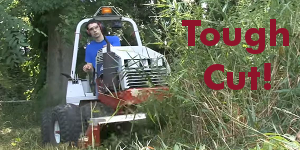 Capable of tackling saplings and large thorn bushes, Ventrac’s brush mower makes short work out of overgrown thickets. Want a demo? Call us at 612-333-3487 or by fill out the form on this page. Working in wet muddy conditions? Watch the Ventrac work without damaging turf. Need something bigger? Holder + 87″ flail mower. The Holder + 87″ flail mower is perfect for large scale operations like clearing out park trails and road side ditches or mowing large fields. See our Holder page for more information. Click any image for details.